Hey guys, today I’m going to share 3 of the best decks for you to get to Arena 7 (Royal Arena) very quickly! Now if you’re a new player, then getting to Royal Arena is a big challenge, so don’t rush it. You need to first make sure that you’re leveling up and have high level cards to compete against the much tougher players. 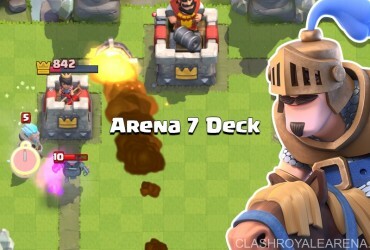 Most new Royal Arena players are either level 7 or level 8, but it’s also very possible for level 6 players to get there as well. This guide was submitted by Ash, check his YouTube channel at here. So let’s start with the first deck, which utilizes one of the best offensive duos in the game, the Prince and Hog Rider. This is a deadly combo for any player to defend against. The Prince is a melee single target attacker, so he can be quickly overwhelmed by lots of low HP troops, so to help him get through, we must add lots of splash attackers. That’s why we have the Wizard and Bomber, both troops able to quickly kill hordes. The Wizard is excellent for stopping the Minion Horde as well. If you also have the Baby Dragon or Witch, then I recommend replacing the Bomber for one of them. Like the Prince, the Hog Rider is also a ground single target troop, but he prefers attacking buildings and towers. 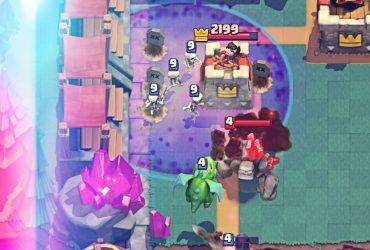 So to help him and stop defensive structures like Inferno Tower, Tesla, or Cannon from distracting our Hog Rider, we added a Lightning Spell and Fireball. If you don’t have the Lightning Spell, then another great option is the Freeze Spell, which is an excellent combo for the Hog Rider. We also need something to stop our opponent’s Prince and Hog Rider, so we have Barbarians. Next up, we have my favorite air deck, which consists of the best air attacking combo in the game, the Balloon with Baby Dragon and the Minion Horde. We have two of the best splash attackers in the game, which is the Wizard and Baby Dragon. The Freeze Spell is also an extremely dangerous spell with the Balloon, making it a deadly combo, especially when combine it with the Minion Horde or Baby Dragon as well. We have Barbarians to help out on defense, because remember air troops aren’t going to stop a ground troop such the Prince from charging onto your tower, so you need Barbarians. And I chose Archers here over the Spear Goblins, because our Minion Horde is already weak to Arrows, while Archers can live from Arrows. Lastly, we have the mighty Epic P.E.K.K.A deck. If you were lucky enough to obtain the P.E.K.K.A, then getting to Royal Arena will not be a problem for you. Now the main weakness to the Pekka is that he’s easily distracted by hordes or barbarians, goblins, or skeletons. So we need to couple him with lots of splash attackers and area damaging spell cards, and so we have the best combination of that with the Bomber, Wizard, Baby Dragon, Fireball, and Arrows. Our opponent is going to have an incredibly difficult time stopping the Pekka. We also can’t neglect defense, so we also have Barbarians to stop opposing Prince, Hog Rider, or even a P.E.K.K.A.